The Catcher in the Rye author, who died in 2010, left instructions to publish his unseen works, including new stories featuring his most famous character Holden Caulfield. J. D. Salinger was always a guarded artist. He kept a very small inner circle of only “seven or eight people,” says his son Matthew, outside of which nobody could have known that the author continued to write through the years, let alone that he planned to release any more of his works. But a new documentary and accompanying book, both simply titled “Salinger,” are said to reveal both Salinger’s instructions to publish a handful of never before seen stories and details of the elusive writer’s private life. Of the latter, the documentary’s director Shane Salerno says he and writer David Shields have uncovered new details about Salinger’s mysterious first wife–Sylvia Welter, a suspected Gestapo informant–as well as the young Jean Miller (only fourteen when they met) with whom he shared a long correspondence followed by a brief relationship. For me, those sordid details Salerno and Shields boast of leave a bad taste in my mouth. The delivery, against the wishes of Salinger’s family and close friends, gives them all the credibility and dignity of a TMZ scoop. However, the duo insist that their sources regarding the author’s plans to publish are reliable, being “independent and separate” of one another. One collection, to be called “The Family Glass,” would add five new stories to an assembly of previously published stories about the fictional Glass family, which figured in Mr. Salinger’s “Franny and Zooey” and elsewhere… Another would include a retooled version of a publicly known but unpublished tale, “The Last and Best of the Peter Pans,” which is to be collected with new stories and existing work about the fictional Caulfields, including “Catcher in the Rye.” The new works are said to include a story-filled “manual” of the Vedanta religious philosophy, with which Mr. Salinger was deeply involved; a novel set during World War II and based on his first marriage; and a novella modeled on his own war experiences (The New York Times). Regardless of the Salingers’ protests to the film and book’s credibility, the two have generated the unavoidable media frenzy any Salinger details are bound to kick up. Honestly, the book could say anything and we’d be licking it up (“J. D. kept bees? Quick, let’s tweet about it! 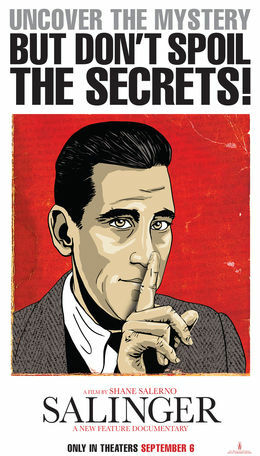 )”; the key to Salinger’s sustained fame has always been the secrecy that surrounds him. Thankfully, though, the world has chosen to focus on his forthcoming collections, rather than the fact that the character of Esmé was apparently inspired by his underage girlfriend. Is that more or less fair? I’m not sure. Til then, I suppose we can indulge in the sensationalism of the film, out September 6th, and its book, which hits shelves on the 3rd. Great story. I’ll be waiting.